Just one third-level campus has been marked as “heavily littered” following the IBAL survey. MOST OF IRELAND’S third level colleges have been given the green light over litter levels following a survey by Irish Business Against Litter (IBAL). Launching its 2012 litter league at Trinity College Dublin, IBAL praised the performance of third level campuses – saying that hospitals, train stations and shopping centres should look to those institutions in their own efforts to improve conditions. 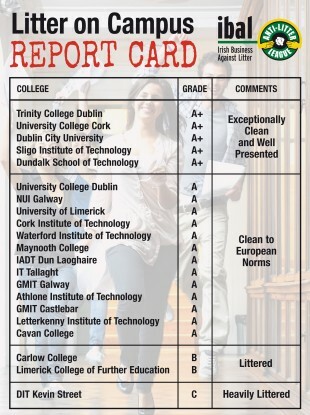 Five Irish third-level campuses received an A+ grade for being “exceptionally clean and well presented”, including Trinity College Dublin, University College Cork, Dublin City University, Sligo Institute of Technology and Dundalk School of Technology. A further 13 campuses were awarded an A grade (clean to European norms) and two were marked B (littered). Only one – DIT Kevin Street – was marked C (heavily littered), with inspectors remarking: “the front of the campus was littered and this was continued throughout”. Following on from the college campus survey, IBAL says it will also be assessing train stations and schools as part of the 2012 league. Some 42 towns and cities will be assessed for litter over the course of the year as part of the 2012 Anti-Litter League. Last year, more than 70 per cent of participating areas were judged to be ‘clean to European norms’. Trim was deemed the cleanest town in the country – however, Dublin City, remained ‘littered’ and the North Inner City was deemed a litter blackspot. IBAL said that dog fouling and chewing gum in particular has become a “high profile” issue in the past year. “We’re receiving lots of feedback from members of the public abhorred by dog fouling on pavements. We know some authorities are giving out free scoopers and even dog nappies are being considered by others. Alongside gum, people are understandably intolerant of this insidious and unhygienic form of litter,” said IBAL Chairman Dr Tom Cavanagh. Cavanagh added that a new development to the IBAL programme is to be a Business Achievement award, which will acknowledge the contribution of a chamber of commerce, traders’ association or shop owner to a litter-free environment. “As a business organisation, we are quick to recognise that businesses have a key role to play in keeping the community clean, not least at a time when public resources are squeezed,” he said. Email “Green light given to most third level colleges graded on litter and cleanliness”. Feedback on “Green light given to most third level colleges graded on litter and cleanliness”.